After I travel a while, I get tired of eating every meal at a restaurant, particularly in Europe where the service is slow. I recognize it is slow to allow diners to enjoy their meal, but when I am on my own, sitting around is not my first choice. I’d rather be exploring. As such for the few days I was in Poland, I seeked out some Krakow street food. Fortunately, I visited during the Christmas markets which made eating street food easier. I picked out a couple of traditional Polish meals. First, Pierogi. Once considered a peasant food, pierogi gained popularity among all social classes, including nobles. Now they are considered Poland’s national dish. A pierogi is a noodle dough filled with a savory or sweet filling boiled in water and sometimes fried. I visited the Domowe Pierogi stand at the Christmas market and ordered a plate of ten pierogi for 17 zloty (less than $5). I picked five spinach and feta pierogi and five mushroom and cabbage. The young lady at the booth added on a “Ruskie” which is a popular choice! Another night I visited the Goralska Chata stand which served traditional soups. I tried a bowl of Bigos for 15 zloty. Bigos is translated in English to Hunter’s Stew. It includes a variety of meat such as pork, beef and chicken as well as sauerkraut. A nice hearty bowl is warming on a cold night! Of course, not everyone travels to Krakow during the Christmas markets. Not to worry, there are still many restaurants with a to go window for Krakow Street Food. As I walked around Old Town, I noticed two walk-up places that locals visited. The first place was called Kebab Zapiekanki. Kebab restaurants are very popular around Eastern Europe, but this one seemed like a favorite. Each time I walked by, people were ordering kebab tortillas from the picture menu. I selected the falafel kebab, and frankly it was wonderful! Perhaps I was excited to have some greens and vegetables along with it. I felt that before I left Krakow, I needed to try a traditional dessert. 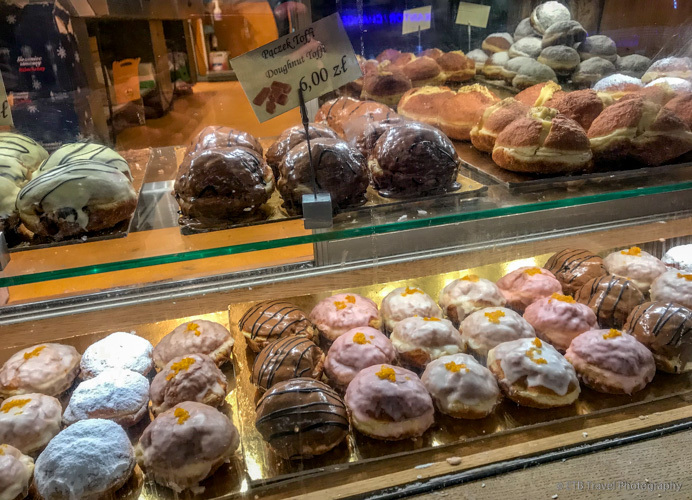 Fortunately, a café called Restauracja & Pub Grodzka 6 had a display of Paczki, which are doughnut with sweet filling. The café also seats people for meals and I noticed many people entering various doors. I didn’t even see the to go window until some in-the-know patrons ordered some treats! While Vodka isn’t Krakow street food, who can visit Poland without tasting their Vodka. I couldn’t. And what better place to taste it than at a bar called Wodka! Ok, this bar mostly catered to tourists, but it was a fun experience. The bartender was so friendly and helpful. I had no idea what to choose for my flight of three tastings in sherry glasses. She asked if I preferred bitter or sweet, fruity or not….and so forth. I ended up with walnut, ginger, and wormwood. I had never heard of wormwood, but apparently it is a popular choice in Poland, so I took her advice. I carried my tray upstairs to a small nook where I imbibed in spirits with some folks from the Netherlands. We had so much fun! As for the vodka, the walnut was the best. The wormwood burned. And the folks from the Netherlands enjoyed multiple rounds of hazelnut! Since I stayed in Old Town, most of my culinary experiences took place nearby. I did, however, venture over to the Jewish quarter where I ordered some roasted vegetables at Ha Ha Bar & Grill Na Kazimierzu. The server was so friendly, and the vegetables were delicious!